In this short video, I bottle a recent brew for short term storage and travel. I’m really not worried about them lasting for more than a few days although they should be fine for some time. You can choose a tube that either goes inside your faucet, as I did, or one that goes on the outside of your faucet. 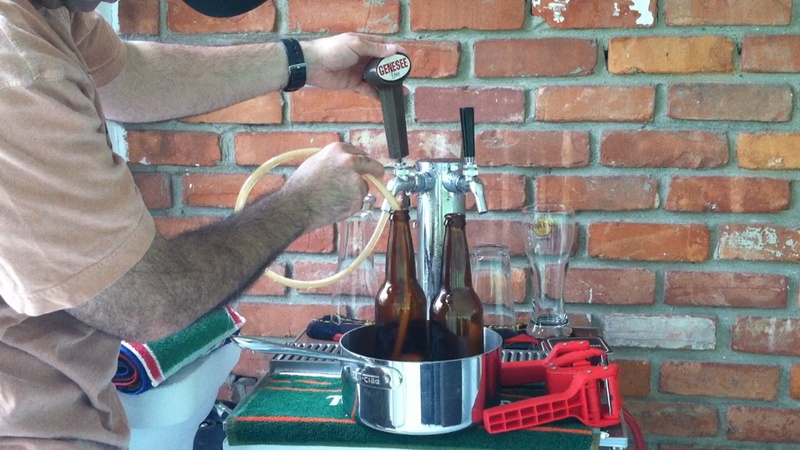 I have Perlick faucets and used some extra 3/16″ tubing I had left over for my beer lines. 1. Begin by sanitizing bottles, caps and tubing. 2. Then we’ll shut off the gas so we can lower the pressure down to about five pounds. 3. Insert tubing inside faucet and ensure the other end reaches the bottom of the bottle. 4. Then let the beer flow; there may be extra foam which is okay, because it will give it more CO2. 5. Once all bottles have been filled, using your bottle capper, cap off all bottles.